( Human Rights Watch) – On Saturday, Palestinians in Gaza will head to the fences with Israel that effectively serve as their prison wall– as they have done for over a year, since they began weekly demonstrations against Israel’s more than decade-long closure of Gaza. 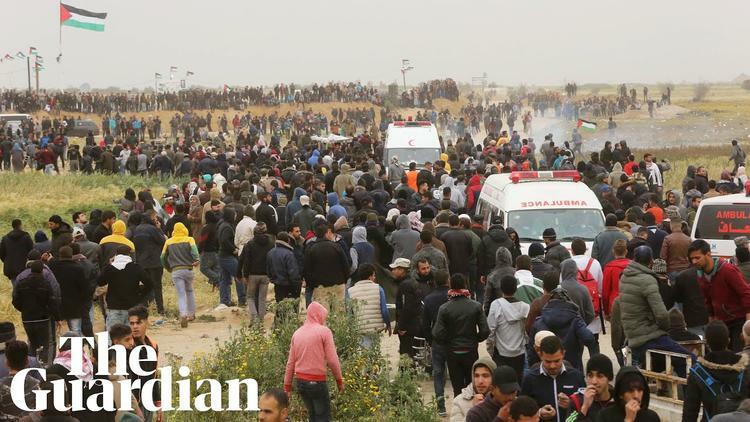 I’ve spent much of the past year speaking to men, women, boys, and girls who participated in the demonstration, often in hospitals, as part of Human Rights Watch’s investigation into the protests and Israel’s response to them. The sights and sounds haunt me. Screams of protesters who have only over-the-counter drugs for their pain as they await surgery as doctors prioritize even more serious injuries. Tears of families grieving the deaths of loved ones. A high-school student’s joy showing me a video of him singing beautifully as he lay in a hospital bed with a leg injury with his mother weeping beside him. Abier Almasri is a Research Assistant, Middle East and North Africa Division of Human Rights Watch.